What Causes Pain in a Leg? Trauma is the most obvious cause of leg pain. Falls, near falls, and twisting injuries can damage bones, muscles, and joints or a combination of all three. There are many non-traumatic causes of leg pain. Fractures: The terms fracture, broken, and cracked all mean the same thing when referring to a bone. It means that the integrity of the bone has been compromised. The most common symptom is pain which arises from the nerve endings located in the lining of the bone itself, called the periosteum. 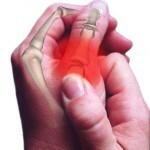 As well, the muscles surrounding the bone go into spasm and intensify the pain. Sprains and strains: A ligament injury is called a sprain and occurs when the ligament fibers are stretched, partially or completely torn. Muscles and tendons can also be stretched or torn, causing a strain. 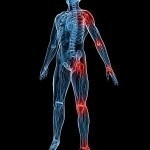 Both sprain and strain result in swelling and inflammation that causes pain. Bleeding: Injuries can also cause bleeding into tissues and joints. Since blood, like any fluid, cannot be compressed, the swelling causes significant amount of pain as the pressure increases. Blood clot: A blood clot can completely obstruct one of the arteries to the leg and cause the acute onset of pain because the blood supply has been completely cut off. Aside from pain, the leg becomes cool and pale. While there are many potential sources of a blood clot, one common place to look is the heart. If the cardiac arrhythmia known as atrial fibrillation is present, there is the potential that small clots can form on the lining of the heart and break off to travel through the arteries, obstructing blood flow at points distant from the heart. Aside from the leg, the obstruction may occur in one of the blood vessels leading to the brain, causing a stroke. Peripheral artery disease: this is Pain in one leg, it may stem from a decrease in arterial blood supply due to narrowing of blood vessels to the leg. Often the pain comes with activity, since walking requires more oxygen for the muscles and if the arteries are narrow and can’t supply that need, the muscles begin to hurt. Muscle injuries: The muscles in the leg tend to be in balance with each other to promote joint stability and act as shock absorbers for the forces that are generated by walking and running. Leg pain in children: Leg pain in children is a special situation. While most leg pain in children is not serious, there are times when the pain has a significant cause. These may include a joint infection causing hip pain, trauma causing damage to growth plates, and pain due to systemic illnesses. “Growing pains” are most likely due to muscle overuse, although they may be associated with a mild stretching as the muscles grow along with bone.